Mavis is a BR Class 04 0-6-0 fitted with additional cowcatchers and sideplates so that she can run near public roads. Mavis is painted black with hazard stripes on her front and rear. 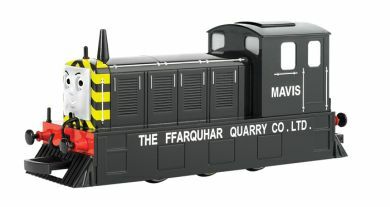 She has her name and "The Ffarquhar Quarry Co. Ltd." written on her sideplates in white.